Cot for babies. Pet friendly. Cable TV with children's channels, movies, etc. House facing the sea with 3 bedrooms. Condominium with safety and recreation area. * Playstation 4 with games and 2 controls. Watch online movies, serials, children's drawings (Netflix, DVD, Pendrive, Youtube, etc). Fun for the whole family, from babies to adults. * The house is beachfront. You will wake up listening to the waves of the sea. A movie view. * Private barbeque, inside the house, complete with utensils (skewers, grills, etc). * Cot and high chair for babies. Even more comfort for the little ones! * We provide beach chairs and umbrella at no additional cost, for greater comfort and convenience of our guests. * 42 "LED TV with SKY HD Cable TV with over 100 channels. Movies, serials, sports, children's channels. * Pet-friendly house. We allow up to 1 small dog. Stay with your most beloved pet. * We provide beach chairs. More convenience for our guests! Avoid surprises and additional costs when renting chairs on the beaches. Our most frequent question: How is the beach in front of the house? * The shallow beach has calm water, hotter than geriba (as it is on the left side of the peninsula). The shallow beach has practically no waves, it is ideal for guests traveling with children. This beach was chosen by the newspaper OGLOBO (Notebook of Tourism) in 2013 as the cleanest of Búzios. * We offer special forms of payment in installments for high season and holiday periods. Contact us! * LED TV 42 "
First, Hospitality was terrible, never meet the host (Erika) but sent son to give key. House was not ready upon check-in and I was already shocked by dirt road entrance and security booth with no security. Internet service was the worst only .5mbps. Host never responded, messaged Owner Gustavo and told me he would call provider. Never reponded back to me which i expected. Beach was not a beach for bathing very dirty and full of beer cans/trash, only good for wlaking/jogging. I thought i would listen to waves crashing but, just truks, cars and motos zoom up and down the only entrance into Buzios. Location is not the best at all. House is fairly new, only rent if you can travel to surrounding beaches and like remote areas and not reliate on internet. Host did not even show to take key we waited 1 hour for doorman who never showed. Had to leave key opening at security desk and took pictures. Glad i can to visit was considering renting for Christmas. Property owner is not organized or responsive to problems during stay. This is not fair to people spending money and none responsive. The guest arrived late at night and we always leave the keys with the doorman. The internet was never down neither defective. The fact is that the guest wanter to watch HDTV over the internet, which we explained it shoudn't be possible. The internet connection is 20 Mbps, which works normally most of the time. The guest wanted to stay more days, and we told him he would have to pay extra for such period. Proprietario sempre disponível, muito atencioso. Chegamos bem, recebemos a casa bastante limpa e em 'ótimas condições. Local tranquilo , com uma praia muito legal em frente. Adoramos a casa, instalações atendeu plenamente nossas expectativas, condomínio pequeno, bem cuidado, local super tranquilo, fora da agitação, praia próxima, pretendemos retornar, só temos a agradecer ao Gustavo e a Erika pela acolhida. Pesquisamos bastante diversas casas antes de alugar. O Gustavo foi muito atencioso conosco. Escolhemos esta casa pois fica exatamente de frente pro mar, e pudemos levar nosso cachorrinho conosco. Ficamos muito nem hospedados, muito a vontade. A casa tem utensílios completos de cozinha, play 4, Internet em ótimo funcionamento e boa velocidade. Gostamos muito. Gostamos de tudo. Ótimo atendimento. Horários de entrada e saída bem flexíveis, pudemos viajar com calma, aproveitando bem todos os dias. Pegamos um tempo ótimo durante a estadia, ainda bem! A casa fica de frente para o mar. A praia em frente a casa é limpa e tem a água tranquila, é boa para crianças. Tem supermercado perto, e fica perto também das outras praias como Geribá, Arraial, etc. Os valores listados no anúncio se aplicam somente a baixa temporada, dentro de estadias longas. As tarifas listadas não se aplicam a feriados, férias, alta temporada ou grandes eventos. Para obter estes valores, por favor consulte-nos. Com pagamento pelo site = Checkin 16h / Checkout 11h Todos os ocupantes precisam estar cadastrados (adultos, cães, crianças e bebês). Não são permitidos visitantes. Valor das diárias variável de acordo com numero de pessoas e quantidade de dias. Não é permitido estacionar vans, ônibus nem veículos comerciais no interior do condomínio. 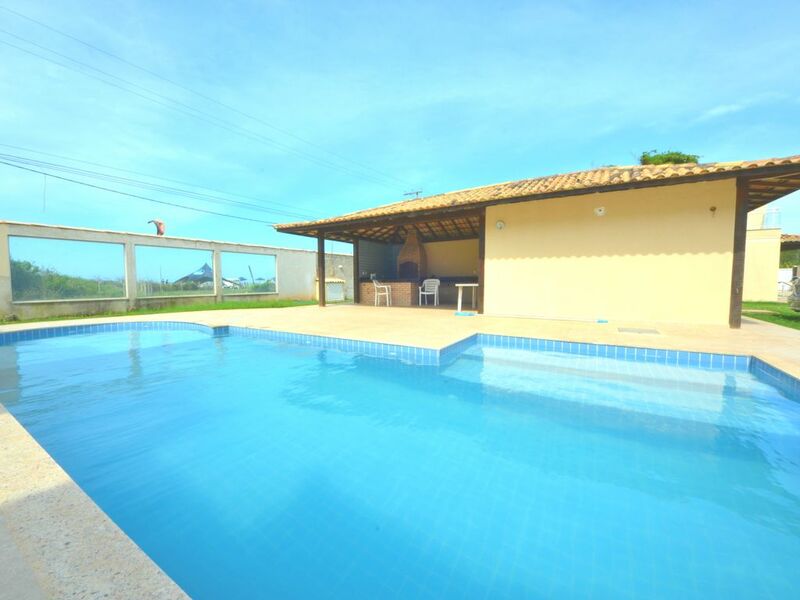 A casa possui uma vaga de garagem destinada exclusivamente a veículos de passeio. Aos valores da locação, são acrescidos os custos de energia e condomínio, a serem calculados de acordo com o período da locação e número de hospedes. Oferecemos condições especiais de parcelamento sem juros para estadias em alta temporada e feriados como ano novo e carnaval. Cães são permitidos sob aprovação prévia (precisa informar raça, peso e idade), e em seguida, confirmaremos a possibilidade. Cada cão conta como sendo um hospede na estadia. Não permitimos gatos ou outras espécies de animais. Pelo fato do checkin e checkout terem horários flexíveis (dentro das condições estipuladas no anúncio) , a contagem das diárias por padrão é por dias e não por noites.